It's a scene often observed in the White House. 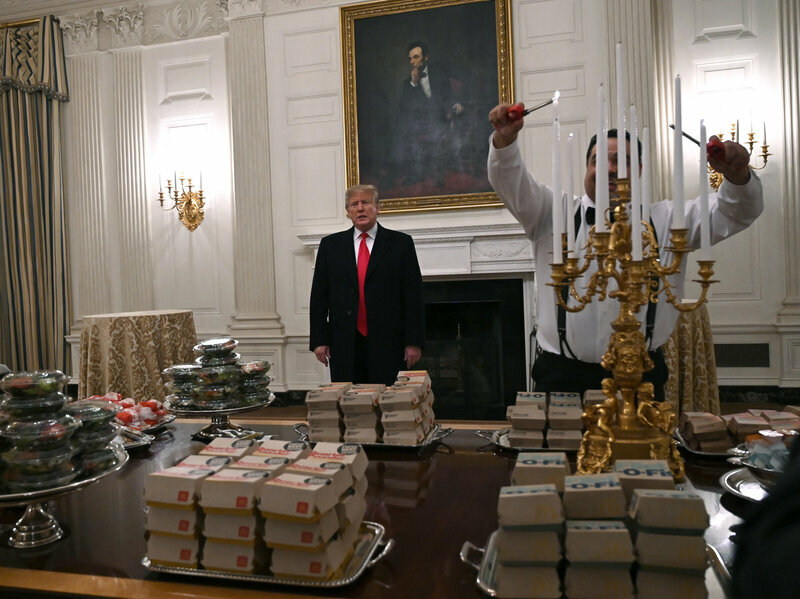 Men in bow-ties light golden candelabras while the president of the United States stands behind the table containing small mountains of food on silver trays. In this case, we'll have to rely on late night comedians and Twitter observers, who roundly ridiculed President Trump for the feast he provided for the Clemson Tigers. Clemson beat No. 1 ranked Alabama to take the College Football Playoff National Championship, and might have expected that a visit to the White House would command a dinner befitting a champion. Instead the Tigers got a dinner befitting a drive-through customer — granted, on fancier plates. "I think we're going to serve McDonalds, Wendy's and Burger King with some pizza," Trump told reporters beforehand. "I really mean it. It would be interesting. And I would think that's their favorite food." Because of the shutdown, most of the staff in the White House residence had been furloughed, so Trump paid for the meal himself, he said. Trump's magnanimity did not spare him from the biting tongue of Twitter. "Great American food!" Trump told reporters at an informal press conference before the meal. "And it could be very interesting to see at the end of this evening how many are left." He declined to say whether he prefers McDonald's or Wendy's. "I like 'em all. If it's American, I like it." I thought NPR News was the last bastion of non-partisan news reporting? NPR - slightly left of center. To trumpian conservatives anything to the left of Paul Ryan is "fake news"
I would kinda expect this story from USA Today, or CNN, not NPR. I certainly wouldn't expect it to be so opinionated from NPR. Unless it was meant as an opinion piece from them, but it wasn't classified as such. Here's another quote from that article you didn't copy: Perhaps befitting Trump's hard stance on the southern border, it is not clear whether tacos were served at the gathering. Is this now the News? snowflaky responses to any perceived slight to our Prez is "the new normal"
Roger Stone, a long-time ally of U.S. President Donald Trump who advised his 2016 presidential campaign, was arrested on Friday and charged with seven counts, according to a grand jury indictment made public by U.S. Special Counsel Robert Mueller’s office. 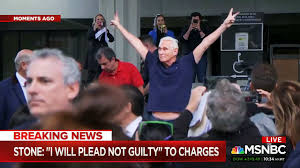 Stone, who was indicted on Thursday, faces one count of obstruction of an official proceeding, five counts of making false statements and one count of witness tampering, according to the Special Counsel’s Office. Stone is scheduled to appear at the federal courthouse in Fort Lauderdale, Florida, later on Friday, Mueller’s office said. Stone has faced scrutiny for his support for Trump during the 2016 presidential election campaign, when Stone implied that he had inside knowledge of data obtained by hackers that could embarrass Democrats, including Trump’s rival for the White House, Hillary Clinton. One step closer to Mr. Trump. I hope Mr. Stone sold a lot of those novelty stones he was hawking. While lawyers can often squeeze blood out of a stone, no pun intended, they are more interested in squeezing dollars out of this one ... pun intended. The Ford Motor Company will send hourly workers $7,500 checks in March as part of the company's profit-sharing agreement. Those checks would have been about 10 percent bigger if not for the tariffs that sapped hundreds of millions of dollars out of the carmaker's profits last year. During a discussion Thursday with reporters about Ford's annual financial report, Bob Shanks, Ford's chief financial officer, said the company had lost about $750 million due to tariffs, the Detroit Free Press reports. Under the terms of their union contract, hourly workers at Ford production facilities earn a $1,000 bonus for every $1 billion the company makes in profits in North America. 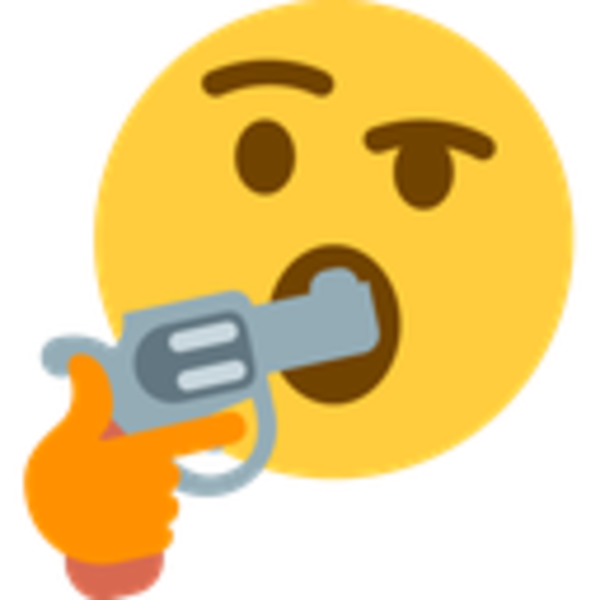 So having to pay $750 million in higher taxes because of Donald Trump's tariffs translates into a $750 reduction for each worker. Beyond the direct costs of the tariffs, Ford reported an unexpected $1.1 billion increase in supply costs for steel and aluminum—a knock-on effect of Trump's 25 percent tariff on imported steel and 10 percent tariff on imported aluminum. When those tariffs jacked up prices for imported metals, domestic producers raised their prices too, a Ford economist tells the Free Press. The reduced checks for Ford factory workers is the latest example of how Trump's protectionist trade policies often hurt the very blue-collar workers and industries the president says the tariffs are supposed to be helping. The tariffs have also backfired spectacularly for American farmers, who now have to pay higher prices for equipment and supplies while also losing access to export markets in China. The Trump administration has scrambled to hide that mess by offering to bail out farmers, but the bailout funds are likely insufficient to cover all losses—and some people who aren't really farmers have been getting funds from the pot. Ford workers may be disappointed by their smaller profit-sharing checks, but other blue-collar workers have faced layoffs because of the costs of Trump's tariffs. From a factory in rural South Carolina where televisions are assembled to a nail manufacturer in Missouri, the higher costs created by tariffs have translated into pink slips for American workers. Accoring to an analysis by the Tax Foundation, Trump's tariffs will reduce the gross domestic product, a shorthand measure for the overall size of the economy, by about $30 billion while also depressing wages and costing more than 94,000 jobs. Oh, and Americans have already paid more than $42 billion in higher taxes due to tariffs—a $146 decreasein after-tax income for middle-class Americans. Those taxes aren't saving jobs or resurrecting America's industry. Like the $750 that will be missing from those checks handed out to Ford's hourly workers later this year, those dollars are being transferred from American wallets, bank accounts, and balance sheets to the federal Treasury. 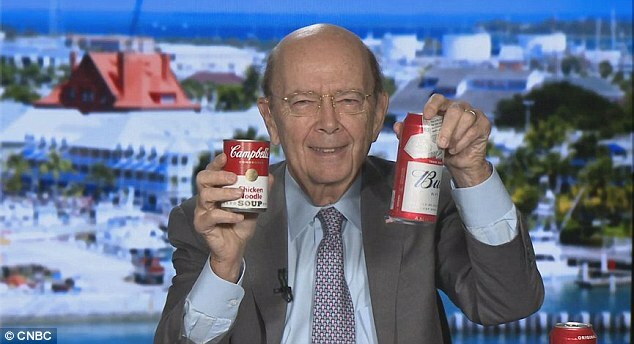 That's what tariffs do. President Trump has endorsed a bipartisan deal that could end the 35-day partial government shutdown, making a way for a three-week stopgap funding measure to reopen shuttered agencies. "I am very proud to announce today that we have reached a deal to end the shutdown and reopen the federal government," Trump said in the White House Rose Garden. The proposal backed by congressional leaders would fund the government through a Feb. 15. The deal does not right now include funding for the wall along the Mexican border President Trump has pushed for, a House Democratic source says. But that the three-week spending bill would would also include a deal to move forward on the longer-term Department of Homeland Security funding bill without any wall money, the source said. Federal employees who have been working without pay or are furloughed would also get back pay as part of the agreement. The Senate would vote first on the agreement, and Trump said he has instructed Senate Majority Leader Mitch McConnell, R-Ky., to put it on the floor immediately. The breakthrough comes as federal workers missed their second paycheck in a row on Friday, now going without their salary for more than a month. The prolonged stalemate has pushed the nation's security and infrastructure to the brink, with significant flight delays at major airports due to FAA and TSA absences escalating on Friday. The FBI has also warned, with their agents limited and working without pay, critical crime-fighting measure are also being curtailed. Needed a distraction from Roger Stone indictment. I actually think he did it because he wants to do his SOTU and this was a quick way to do it. Miller's sitting on Trump's shoulder with his pitchfork whispering that if Trump can just get on TV, he can convince the country, then he can do Shutdown 2019 v2.0 in mid-February and the entire country will now blame the Democrats. As for Stone, there'll be another distraction as Mueller's getting closer and closer to Trump's inner circle. I bet Don Jr. has a bag packed and carries his passport with him everywhere. I actually think he did it because he wants to do his SOTU and this was a quick way to do it. Ah, yes, forgot about the SOTU address. Thankfully I'll be watching Indiana High School Girl's Basketball at the largest high school gym in the State that night. I'm sure it's a Government boondoggle kind of a place, but I'm excited to see it for the first time. Our government has become a Seinfeld episode. A show about nothing. "This morning's widely-circulated characterization of Roger Stone as a Nixon campaign aide or adviser is a gross misstatement. Mr. Stone was 16 years old during the Nixon presidential campaign of 1968 and 20 years old during the reelection campaign of 1972," the Nixon Foundation tweeted. The foundation added, "Mr. Stone, during his time as a student at George Washington University, was a junior scheduler on the Nixon reelection committee. Mr. Stone was not a campaign aide or adviser. Nowhere in the Presidential Daily Diaries from 1972 to 1974 does the name 'Roger Stone' appear." 21 days. 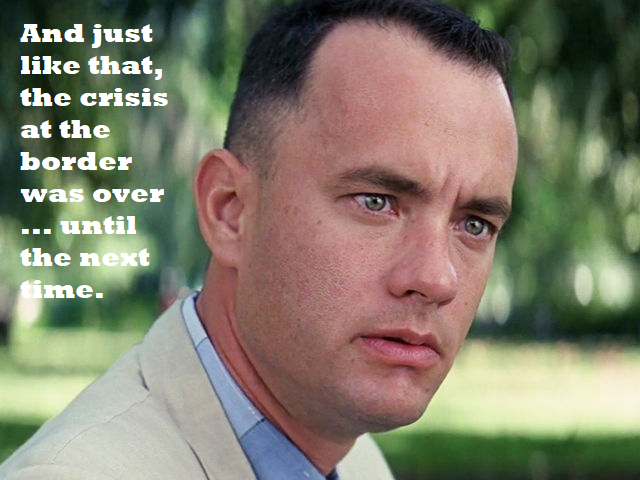 Congress and the senate will have to have a plausible border protection solution passed or (a) shutdown, (b) emergency declaration. Watch and see which one happens. "... until the next time." Did anyone listen to the speech in the Rose Garden? The President opened the Government for 3 weeks. He literally said you have 3 weeks to fund the wall. 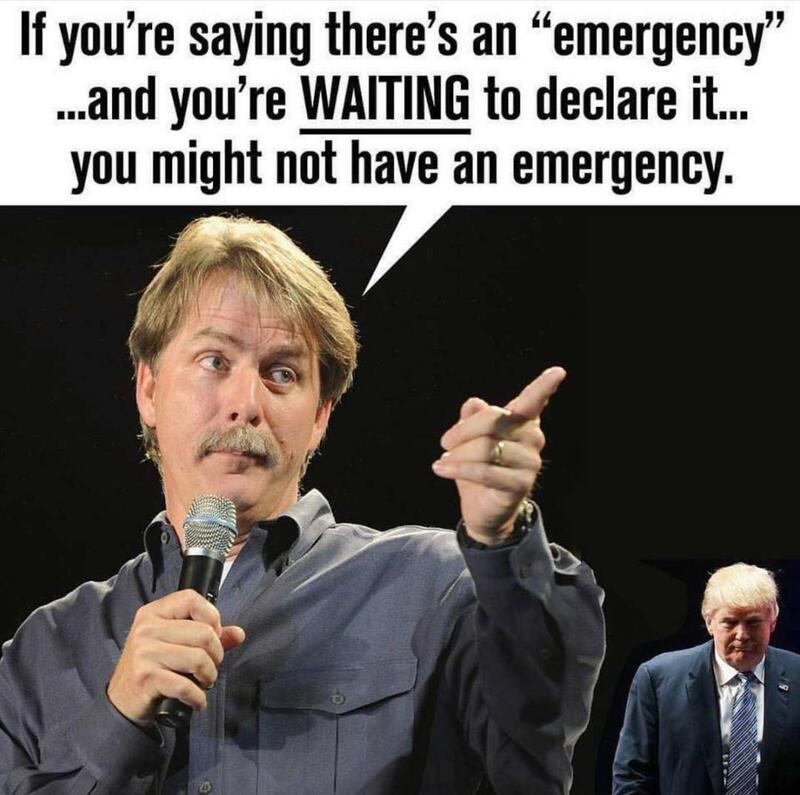 If not - it's an emergency. Pelosi already said she wouldn't negotiate until the shutdown was over......It's over, workers are being paid, the SOTU will take place. If in 3 weeks, there is no resolution, this President will finish this in his way. He and every President since Reagan has promised a solution, he is determined to deliver a real fix. 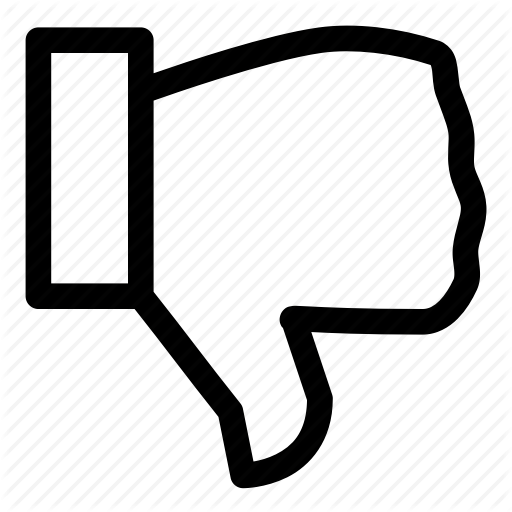 I would bet if the House and Senate cannot come up with something, the DACA olive branch he was dangling will disappear. Did anyone listen to the speech in the Rose Garden? The President opened the Government for 3 weeks. He literally said you have 3 weeks to fund the wall. If not - it's an emergency. The bigger problem, however, with Trump’s “military version” of eminent domain is the implication that he can divert military funding to order the military, most likely the Army Corps of Engineers, to seize land and construct the wall without statutory authorization. This is where Trump finds himself at a roadblock. As Bruce Ackerman, law professor at Yale Law, rightly notes in his recent op-ed in the N.Y. Times, the Supreme Court has invalidated variations of the emergency power in its 1953 Youngstown v. Sawyer ruling, striking down President Truman's seizure of the steel mills during the Korean War as lacking implicit or express constitutional and statutory authority. However, while the Youngstown ruling restricted the "presidential" power to take private property during a national emergency, without statutory authorization, the court’s majority opinion did not explicitly restrain the "government" power to seize private property during a national emergency. The ruling noted that the president does not have the power to order the military to seize private property and that the power is the "job for the Nation's lawmakers, not for its military authorities." If Trump wants the military to seize land for the construction of his wall, he should follow President Lincoln’s lead from 1864 by signing onto an appropriate congressional authorization that direct funds to and expressly authorizes the secretary of defense to order the Army Corps of Engineers to act. Otherwise, Trump may be abrogating his constitutional authority by ordering the troops to go it alone in seizing land along the border. Then he should scrap his plans for a wall. That is not the solution.